Recently my appetite for jazz and blues recordings, going back to my mid-teens, seems to have increased exponentially. As a result I have been taking advantage of some wonderful opportunities to acquire jazz and blues CDs in large quantities at very small prices. Over the next few weeks I will be writing about some of these acquisitions. Right now, though, I’m working on a couple of mysteries presented by one segment of a big box. Not long ago, while browsing through jazz and blues CD boxed sets on Amazon, I ran across another History 40-disc set, “Nothing But the Blues.” Someone was offering it at a quite reasonable price. Assuming that it was out of print–which does seem to be the case–I bought it promptly and have been gradually listening my way through it. 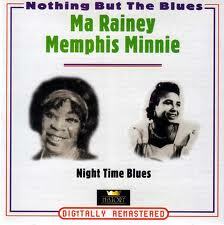 One of the two-disc boxes particularly attracted my attention: “Night Time Blues,” including one disc each of Ma Rainey and Memphis Minnie. They are both favorites of mine. History’s two-disc boxes (which may have been available separately, and do show up that way as used items) include little booklets with listings, brief program notes, and dates and personnel for each recording, very necessary information for my inquiring mind. On two of the Memphis Minnie selections, one from 1935 and the other from 1936, she is accompanied by a pianist identified in the credits as “Black Bop.” This mystified me. And I was curious, too, because whoever he is “Black Bop” is a pretty hot pianist. As he was indeed. It turns out that “Black Bop” is actually just a silly typo for “Black Bob” Hudson. “Black Bob” is described by allmusic as a “ragtime-influenced blues pianist,” which he certainly was. There seems to be little biographical information about Hudson, except that he had a banjo-playing brother named Ed who also recorded widely, often in the same sessions as his brother. Both were members of the Memphis Nighthawks; Bob was one of the Chicago Rhythm Kings. These are both groups I’ll have to investigate. Bob also recorded with a number of other well-known blues performers, including Lil Johnson and Charley West. It’s a bit of a surprise to hear someone who plays that well whose work I was completely unfamiliar with. But my listening through jazz and blues sets and looking at the personnel listings have led me to many such experiences in recent years. It was in a compilation of Commodore label jazz recordings that I first noticed the saxophonist Don Byas, who has become one of my all-time favorite jazz performers even though until I was in my early sixties I’d never heard of him. Now I’ll be looking for more of the ragtime-influenced hot piano of Black Bob. The first result of my research was, surprisingly, to rule out Lead Belly. If you know his work, and you hear these tracks, you’ll be astonished to learn that they are not his playing. They so strongly resemble his style and sound that it’s hard to believe he’s not playing. But in 1924, Lead Belly was still in a Louisiana prison, and it’s not likely that he was released to make recordings with Ma Rainey. Well, here I am in my mid-sixties, still learning more and more about the music I love. As I continue to explore the wealth of new material coming into my collection, I’m sure I’ll be finding more new favorites. Watch this space.